It's getting harder to figure out what is influencing Little Tokyo's popularity of late: beer or food? For those who choose beer, let it be known that Little T is not a one-beer-pub area any more, and I'm in no way referencing Angel City Brewing Co., which is a big place for only serving 4 kinds of beer. 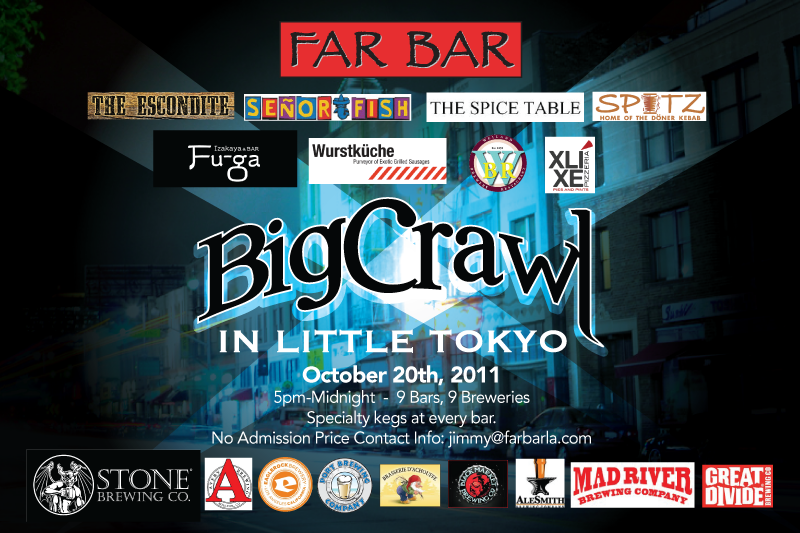 No, beyond Wurstkuche, the landscape is getting larger, hence tonight's Big Crawl taking place in 9 different bars featuring 9 different breweries. 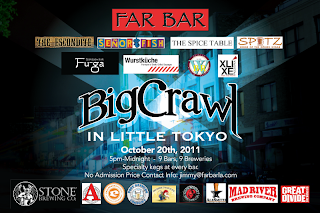 Sponsored by Far Bar, the Crawl will be tapped at such previously unknown beer bars as The Spice Table and Fu-ga, whose bar manager said will be featuring all the beers from the Stone Brewing Company. New pizza spot Xlixe is definitely worth a slice, according to one adventurous neighbor, and I'd suggest grabbing a burger at The Escondite on the early side of the evening before the cardboard boxes take over the sidewalks. Old timers will recognize The Escondite as the old 410 Boyd, of course. There's no admission price. Please don't drink and drive. And on behalf of all LT residents, please urinate in a toilet, preferably one that flushes.